Hope's Cafe: ChristianShirts.net Checkbook Cover Review! A few weeks ago I reviewed a t-shirt from ChristianShirts.net. Well, I was also sent a Checkbook Cover to review, so I thought I'd share my thoughts about it today. As I mentioned before, ChristianShirts.net has a huge selection of pro-life designs that are available on shirts, mugs, tote bags, and many other items. I opted to get the design that says "When environmentalists start saving babies, I'll start saving trees!" While it sounds like a funny statement at first (and I'll admit, there is a sarcastic humor there), it actually is so true. A few months ago we saw some people holding signs about keeping whales in captivity (zoos and such). Now, don't get me wrong...I am against animal cruelty! But, when I asked one of the women if they protested abortion as well, she turned nasty! Literally! She and her fellow protestors started yelling at me and followed me down the street making insulting comments, and even using foul language (even though we had children with us). So, I really like this checkbook cover. It gets a lot of questions as I fill out checks at the grocery store, and opens up some great opportunities to get people to think how awful abortion is! 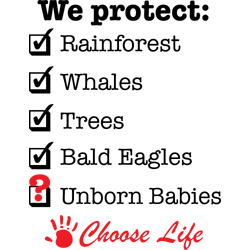 It seems like everyone wants to save the animals, but no one worries about the unborn babies. There are also extra pockets to hold a debit card, id card, or even store discount cards. Disclaimer:I was not monetarily compensated in any way for this post. All thoughts and opinions are mine. All quotes taken from the Christianshirts.net website.